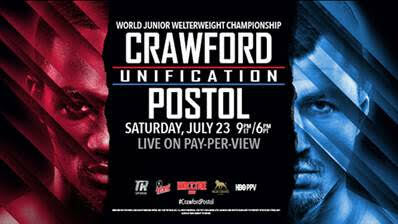 Crawford vs. Postol: Will this fight determine best at 140? By Chris Williams: WBO light welterweight champion Terence Crawford (28-0, 20 KOs) sees his fight next month on July 23 against WBC 140lb champion Viktor Postol (28-0, 12 KOs) as a match that will decide who the best fighter is in the division. The winner of the Crawford-Postol fight will be seen by the fans as the best, but the winner still need to face WBA champion Ricky Burns and IBF champ Eduard Troyanovsky to determine who the overall No.1 fighter is at 140. It won’t be enough for the winner of the Crawford-Postol fight to proclaim that they’re the best. They’ll need to actually fight the rest of the champions for them to prove it. It’s not known how much longer the 28-year-old Crawford will stay at 140. Crawford wants to become a PPV star and he probably won’t be able to do that if he stays at 140 and gets stuck fighting guys like Dierry Jean, Hank Lundy and Thomas Dulorme over and over again. The Crawford-Postol fight will be televised on HBO pay-per-view, but that’s only because HBO didn’t have any open dates to televise the fight on regular HBO Championship Boxing. Crawford’s 84-year-old promoter Bob Arum didn’t want to wait until HBO had an open date before making that fight. Instead of waiting, Arum decided to put it on HBO PPV. That’s not a good thing if your Crawford and Postol, because it means far fewer boxing fans are going to see the fight than it would have been if Arum had waited. Arum obviously is hoping that a bunch of casual boxing fans will decide to purchase the Crawford vs. Postol fight on HBO PPV, but that’s not how it works. Fans have to first get hooked on a fighter after seeing them many times on regular HBO before they decides that it’s worth it to pay to see them on PPV. Arum is doing backwards in this case, and that means fewer fans will see the fight. If Postil wins this fight, it will be a major upset. Crawford’s promoter Bob Arum is already talking like he’s the next star in the sport. Having the next star beaten by Postol would be a huge blow. I don’t know that it’s a case of Crawford being avoided by anyone. I see it as more of a case of many of the top fighters are on the other side of the promotional fence with them being managed by Al Haymon, and promoted by Golden Boy Promotions. I don’t see them having their fighters avoid fighting Crawford out of fear, but rather it being a business decision. If Crawford wants to fight the best fighters from the other side of the fence, then he might be stuck and unable to. This means that instead of fighting the top guys he wants to, he could be limited to the likes of Postol in rematch after rematch, and fighters like Jessie Vargas. It’s too bad Crawford isn’t facing Vargas now while he still has his WBO welterweight title, because it would be a good scalp for Crawford to beat him while he still has the belt. Vargas will be fighting IBF welterweight champion Kell Brook in September, and he’s expected to lose that fight possibly by a knockout. That means that if and when Crawford does move up to 147 to start fighting Arum’s other Top Rank stable fighters, he’ll be getting sloppy seconds by fighting Vargas after he’s been beaten by Brook. I don’t think the other fighters are going to go hungry. Ricky Burns has plenty of good options available for him. The top welterweights have a lot of options as well. I think Crawford needs to expand his horizons by being willing to fight any and all fighters from 140 to 160. This means that if he can’t get a top light welterweight to fight him, then he needs to look in the 147, 154 and 160 pound divisions. It means that Crawford will very likely need to deal with getting beaten every now and then by bigger, stronger and faster fighters from the divisions above light welterweight, but that’s how he can become popular. He can’t become popular if he only fights 140lb fighters. I already can predict that next opponent for Crawford after the Postol fight. Arum will very likely get the recently beaten Ruslan Provodnikov to fight Crawford in a mismatch. Once Crawford beats Provodnikov, Arum will likely match him against Jason Pagara. I see it going on like this for the remainder of Crawford’s career if he chooses to stay at 140 and only fight light welterweights. I know he doesn’t want to lose, but he’s going to need to make ultimate sacrifice if he wants to increase his star power. I don’t see Arum being able to lure any of the top welterweights down in weight to fight Crawford, nor do I see him getting any of the top lightweights to move up to 140 to fight him. Crawford can forget about former Top Rank fighter Mikey Garcia fighting him, because I don’t see that fight happening in this lifetime. The Crawford vs. Postol fight will take place at the MGM Grand in Las Vegas, Nevada. Boxing » Terence Crawford » Crawford vs. Postol: Will this fight determine best at 140?